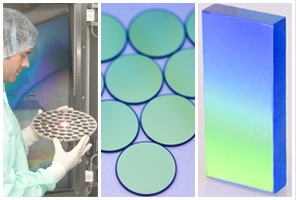 Spectrogon manufactures and develops optical filters, thin film coatings, and holographic diffraction gratings. The company continuously improves production techniques and craftsmanship in order to supply our customers with state of the art products. We design and manufacture optical interference filters employing state of the art deposition technology and the most advanced design criteria available. Applications in spectroscopy, telecom, and ultra-fast laser systems, our high efficiency diffraction gratings exceed our customers´ expectations.